Rachel Bircumshaw, the second wife of William Frost, was born in Heanor, Derbyshire c1836/7 and it is only after some forty three years of life (on the 1881 census) that we discover she was actually born in the Marlpool area of Heanor, a fact that may have been lost to us otherwise. However, before we get ahead of ourselves too much, let us first look back through time to the year of 1841; it was Queen Victoria who was on the throne of England, with 1841 being the forth year of her amazing 64 year reign. With not being 100% sure as to the exact date of Rachel’s birthdate (it is rumoured she was born on the 18th August 1834), either way, this is the first census year Rachel appears on. The place of residence for the Bircumshaw’s at this time is given as ‘Heanor Common’, I am led to believe this was in the Marlpool area of Heanor. As can be seen on the 1841 census form, Rachel is living with her mother Mary (a Laundress) and 4 siblings, her father (Jabez) having died in September 1838. These would therefore have been very hard times indeed. 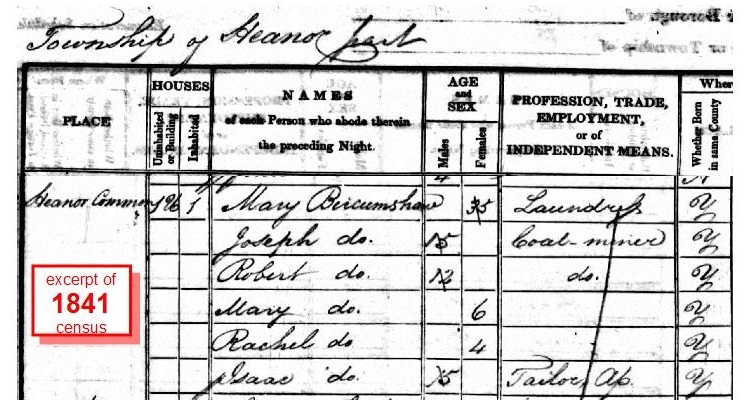 Come the 1851 census and we see Rachel, her mother Mary (now shown as being a widow), and her siblings living in the house of Rachel’s grandfather; Joseph Horsley. There is no specific residential address, all we know is that they were living in Heanor… as the excerpt below shows us. As the census shows, this is a very industrious time for this family, one can’t help but wonder how hectic a household it must have been. The year is now 1861, and it is later in the year that the Frost family welcomes Rachel Bircumshaw and her daughter into their lives. Unfortunately it’s not known as to exactly when Rachel, her mother, her brother, and her own daughter moved from Heanor to Ilkeston, but move they did, and they did so inbetween the two census years of 1851 and 1861. The above image is disjointed in its presentation as the original census recording is written over two pages. There is actually more to relate regarding Rachel and her daughter Mary, for not only does this census tells us that that Rachel is now aged 25 and working as a ‘Glove Stitcher’ it also tells us that she is unmarried, has an 11 month old daughter (Mary), and is living with her mother ‘Housewife’ and Rachel’s brother Robert; a ‘Coal Miner’. As always when there is an ‘illegitimate child’ in a family, one’s always wonders who the father is and why he isn’t with the mother and child, there are of course several reasons for this, unfortunately we not in a position to know these reasons, but the main thing is that both Rachel and her daughter Mary were set to make the most from their move to Ilkeston. Moorbridge (or Moorsbridge) Lane in Ilkeston is extant but is now known as Derby Road. See map below. 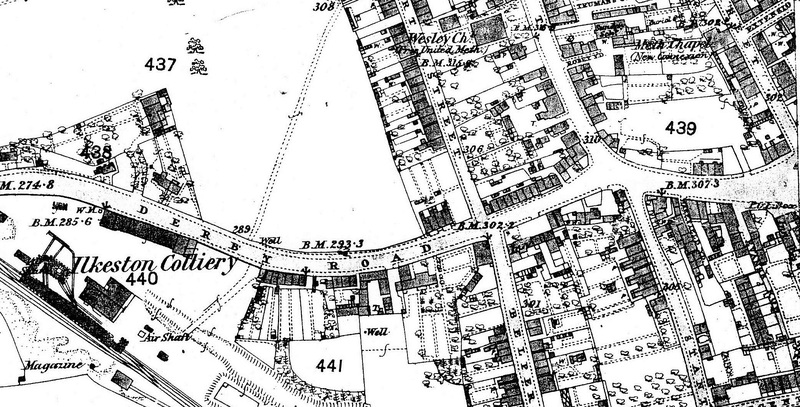 Purely coincidental I know, but I have other ancestors living on Moorbridge Road in 1861, their surname being ‘Severn’, and according to the enumerator for the 1861, the Severn’s are listed as being No122 on the schedule (an example of schedule numbering can be seen on the left of the census page above), they were therefore… so the census implies… living five houses apart from the Bircumshaws! Let us now look at William and Rachel’s early life together.